Think Instagram is just a place that inspires narcissism and envy? Well, it’s not hard to feel so, with over 75 million daily users, it’s more often than not a magnet for humblebrag selfies and photos of new purchases. Even with all those numbers, posts are pathetically small in variety. However, this article is for those who are itching for some cuteness and joy in its purest form. 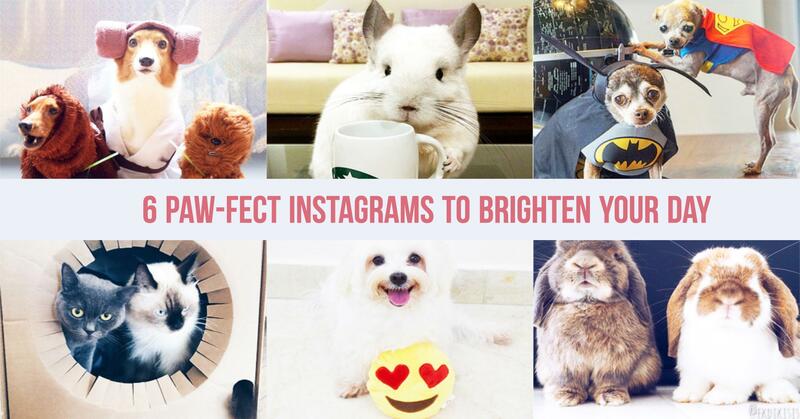 Hit the follow button on these six accounts for daily doses of adorable animals on Instagram. Who doesn’t love a smile? 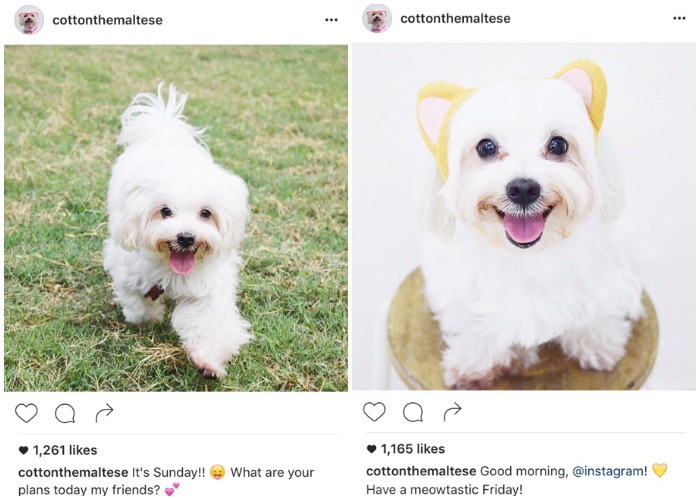 Adorably quipped as the ‘Smiling Maltese from Singapore’, Cotton’s Instagram page is sure to add a sprinkle of sunshine to your feed. What is even more heartwarming than her page is Cotton’s story; she was an abandoned dog who found her new loving home with the help of HOPE Dog Rescue. We sure are glad that Cotton was lucky enough to have been given a new opportunity in life and is now living wonderfully, with 22.4k followers on her Instagram who love her pictures and her little face! Just like the song goes, ‘When you’re smiling, when you’re smiling, the whole world smiles with you’. I think we can all agree that the only thing better than one dog is two dogs. 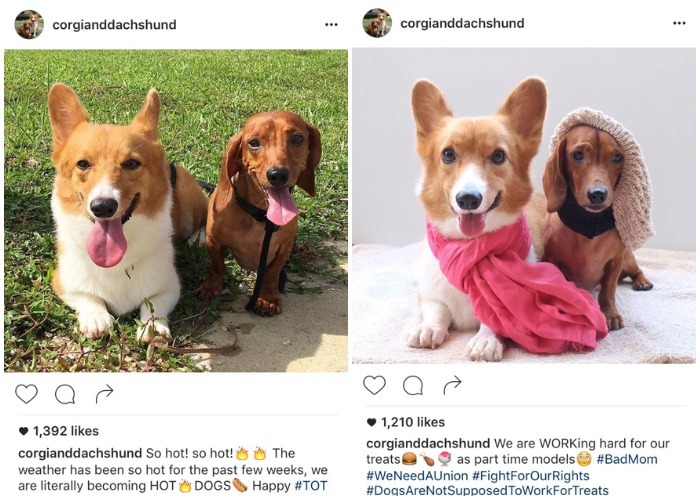 The dog-mance between these two best friends really tugs on our heartstrings and warms our hearts, which explains the 24.8k Instagram followers who adore the pair of pups. Not only is a dog a man’s best friend, but also another dog’s best friend! This chinchilla is an Instagram celebrity with 175k followers. 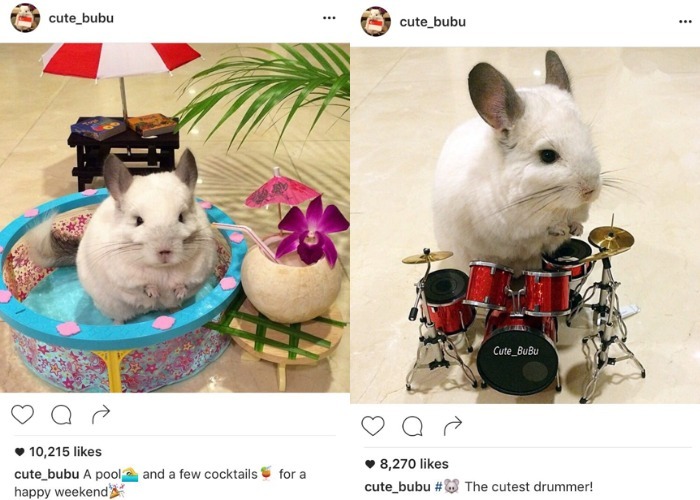 BuBu’s account is overflowing with cuteness as her owners post pictures and videos of her with miniature props like clothes, musical instruments, furniture and more. She truly is living the high life, which oddly makes us slightly jealous of a furry animal that is so much smaller than us. But in our defence, we do wish that we could also relax in our own pool while sipping cocktails or lounge on a beach chair all day. Need I even say more? These pictures speak for themselves in showing how adorable the four rabbits are. 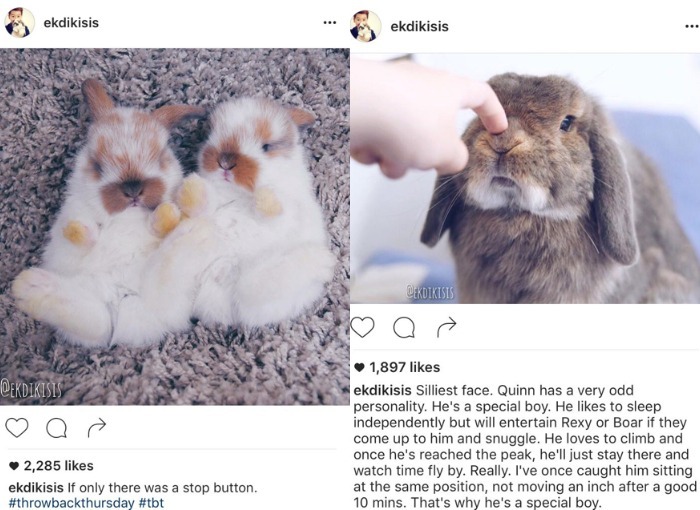 With 29.7k followers on Instagram, making these rabbits more Instagram famous than most (well, probably all) of us, the bunnies have even expanded their social media careers to take over YouTube and they have their own channel. 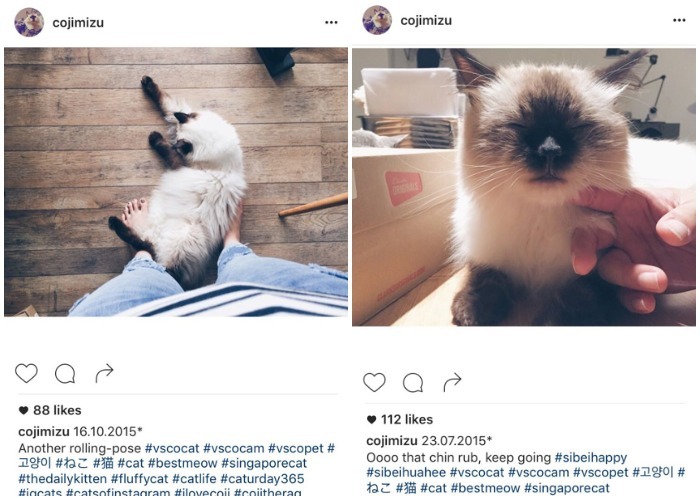 Coji the Ragdoll, Mizu the British Shorthair and Jiyo the one-eyed Exotic Shorthair are three beautiful cats who live together. Their Instagram page, to me, is the most aesthetically appealing out of all the accounts in this article. They might not have the most followers but their account certainly does not lose out to any other pet accounts. Aesthetics + Pretty Cats = A Must Follow! Imagine living in a house with with nine dogs, a pig and many other different kinds of animals. That is exactly what Steve Greig does. This account, with 527k loyal followers, is filled with endearing posts of Steve’s animals – Phyllis, Englebert, Enoch, Madelyn, Edna, Hercules, Loretta, Josh and Eeyore, the dogs, Bikini the pig, a rabbit and some unnamed ducks and chickens to be specific. Like Cotton the Maltese, all of Steve’s dogs are rescues and they come in many shapes and sizes. His posts are cleverly injected with humour and punny hashtags, which makes scrolling through his page very entertaining. Also, I repeat, Steve owns a pig named Bikini. If that’s not enough of a reason why you should follow his account I don’t know what is. 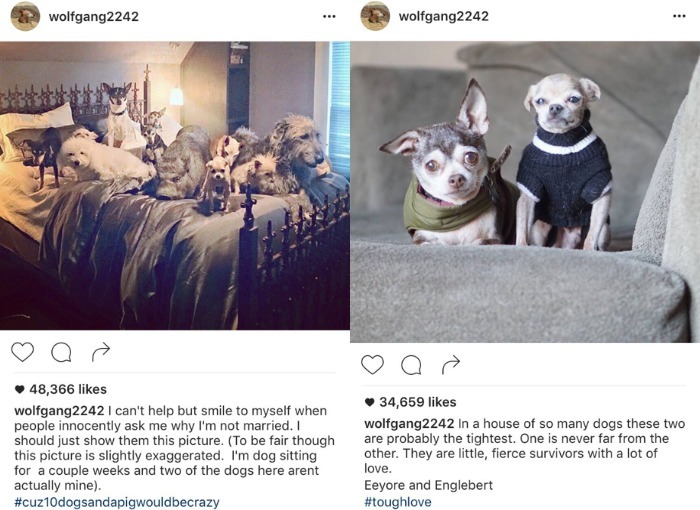 Do you have any pet-related Instagrams to recommend? Let us know!